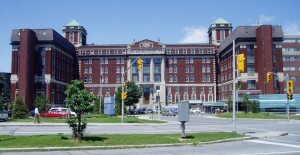 We work out of The Ottawa Hospital, Civic Campus, at 1053 Carling Ave. The Civic has a long history of providing maternity care: approximately 4,200 deliveries happen there every year (and Dr Moores’s mom was born there). It offers a full-service obstetrical department, including a certified Level II Special Care Nursery. Labour and delivery are natural processes, and rarely do we need any involvement from our specialist colleagues. Sometimes they get more complicated and we need to involve other specialists. If the need arises, the Civic has an in-house obstetrician, paediatrician, and anesthetist. We work very closely with these specialists in high-risk pregnancies and deliveries, and patients report seamless care flowing to them as they need it. The Birthing Unit is staffed by specialized RNs, who provide top-quality nursing care and are also available on the telephone for advice around the clock, seven days a week after 20 weeks of pregnancy. The Mother and Baby Unit cares for you and your newborn after delivery. It is also on the 4th floor (Unit A4). You stay with your baby here until it is time to go home. Again, nursing here is excellent. Both units operate according to the philosophy of family-centred maternity care. The Civic Hospital offers an information session for expectant parents. The session is taught by RNs from the Birthing Unit and includes a “virtual tour” as well as an overview of what to expect during your stay. See The Ottawa Hospital website for dates and times. There is no need to register; just show up to a session. When you attend, you can pre-register with admitting, and find the parking lot before the big day! Maps of the hospital are available for your convenience.